I figured I haven't made much bread here on The Sunday Pastry, and it is a very go-to thing to make on a Sunday morning. I think most people agree that freshly baked bread is a thousand times better than the stuff sitting out on your counter or in the supermarket isle. Nothing can beat fresh bread: bagels, brioche, you name it! So, I stumbled across a beautiful new blog this week called Slovakia For the Soul, which was full of beautiful photography, (and I have to say I pinned probably her whole website!). This recipe in particular intrigued me because of the cardamom layers. Cardamom is something I don't bake with it often, if at all, so the recipe had me digging into the back of the spice cabinet trying to find it! I'm very pleased with my results, and this bread is great to kick back and relax with on a Sunday morning! Combine the milk and butter in a saucepan over a medium heat and allow the butter to melt and the mixture to come to a lukewarm temperature. (If it heats too much cool it down by pacing the saucepan in a sink with cold water). In a separate bowl combine the yeast, flour, sugar and salt. Make a well in the center and pour the milk/butter mixture in. Mix thoroughly until you have a dough. (You may need to add a little more flour here to stop the dough from being sticky). Turn the dough onto a clean surface add a little more flour and knead for 5 mins until smooth and elastic. Transfer the dough to a clean bowl, cover with plastic wrap and a tea towel and allow to rise for 1 hour in a warm place. Preheat your oven to 190 deg C and butter and flour a 22cm bundt cake tin and set aside. Prepare the filling by beating the softened butter, cardamom and sugar in a bowl. Set aside. Remove the risen dough, punch it out with your fist and roll into a large rectangle measuring approx. 40cm x 30cm in size. 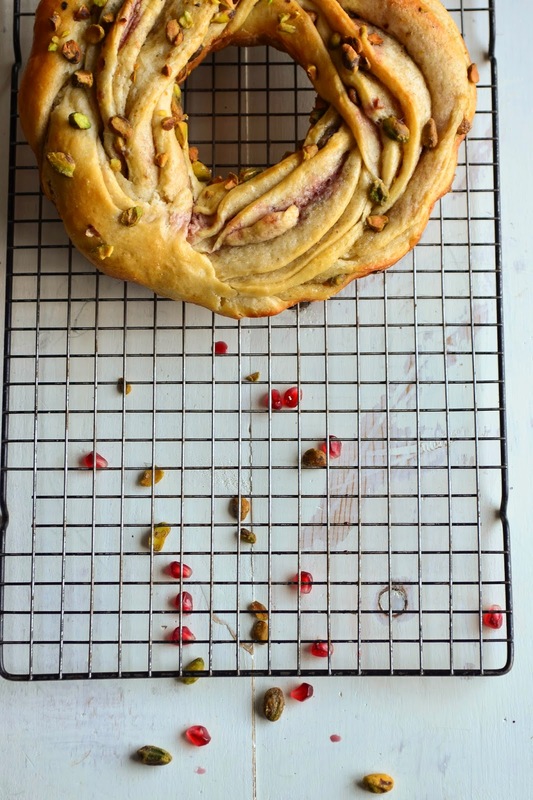 Spread the cardamom/butter mixture over the dough, sprinkle 3/4 of the pistachios and drizzle the pomegranate molasses. With the long end facing you roll the dough into a long cylinder/sausage shape. Starting about 1 inch from the top with a very sharp knife, cut down the length of the center of the rolled dough to expose the layers and filling inside. Alternate the two long pieces of dough over each other and shape into a ring. Gently place into the greased baking tin, brush with beaten egg and sprinkle any remaining pistachios on top. Bake for 25-30 mins until golden. Allow to cool in the tin for ten minutes before gently removing. Allow to cool for a further half hour before slicing and serving. I know pomegranate molasses can be hard to find, so I found a great recipe for it here. Its pretty easy to whip up. I left out the lemon juice though, and I highly suggest doing so. Mmmm this bread makes the kitchen smell amazing, perfect for a weekend morning.